24Symbols founder Justo Hidalgo argues that his company’s business model is a counterbalance to piracy and will generate print sales for publishers. Gutenberg and the invention of movable type which started the publishing industry. Some characters are critical to a specific chapter of this novel, but then seem to disappear for good. Some others linger longer, adapting to the changing environment that evolving culture, technology and society bring to the table. We are now in a new and exciting passage, a key one, where the advent of digital technologies is allowing readers to have access to culture and information in a way even visionaries like Jorge Luis Borges or Vannevar Bush could never have imagined. Along with the excitement and the opportunities, though, a non-trivial set of challenges is causing lots of discussion, concern and even fear. Is the book industry in jeopardy? Piracy is growing in the e-book industry. While not at the levels of music or movies yet, it is said to have reached 35% of published books. This is mainly related to the lower prices of the e-reader devices, the multi-million sales of iPad, new tables and smartphones…all gadgets that can be used to read short and long documents and books. People want to consume content in digital form and they either cannot find it (for years, many books have not been digitized because of digital rights issues, or because of marketing-led blockage) or don’t want to pay a price they see as being nonsense. But the publishing industry should look at their cultural and entertainment industry counterparts to understand that some decisions should not be repeated. Trying to avoid piracy by adding more and more constraints to the books via DRM technologies only encourages pirates, who see cracking DRM as both an intellectual challenge and a duel against “the enemy.” My take has always been that pirates are fans. They love music, or movies, or books, but they just will not allow “the industry” to lead the way they consume that content if they feel what is offered to them is inherently unfair. I truly believe the answer to piracy is engagement. Tomas Boezeman made it clear in his post at FutureBook entitled “Piracy is good”, that he advocates for an “understanding-then-reacting” position. Spotify, the European music-streaming service that has just come to the United States, has proved from a user’s standpoint that it is possible to engage music lovers and decrease piracy by offering something easier to use. Instead of taking the burden of finding a good copy of this book in several peer-to-peer systems or cyberlockers, a service offering “one-click read” options to readers would entice many of them willing to pay a subscription fee. 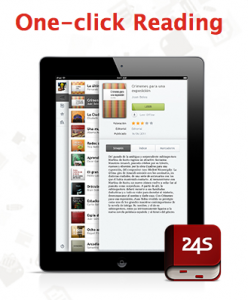 The thinking at 24symbols is exactly that: Why pirate a book when you can read it with just one click? Both e-books and the concept of subscriptions are said to cannibalize the current core of sales: the printed book. If people download e-books, have access to a subscription service, or to ad-supported e-books, who will buy printed books? It’s a legitimate question, but we need to add several key concepts to the discussion to get the full picture: 1) piracy already exists and is already affecting the industry numbers, 2) new internet and mobile-based platforms can provide a viral buzz to books, and 3) the resurrection of the backlist and out-of-print catalog. First, we must finally admit that piracy exists and will not disappear any time soon, no matter what we do to stop it. No DRM system is perfect, there are always options to circumvent it. And even if there were, we have already seen examples of how a network of peers can have a pirated, DRM-free version of a book ready in a night (as J.K. Rowling knows.) Therefore, and as a minimum, publishers should adopt a simplified legal platform for the purchase of e-books and implement the use of a freemium/subscription model that eases access to e-books; as has been demonstrated before in other industries, many people will not abandon piracy, and sales will increase. Yes, some percentage of the readers might decide to opt for the subscription service instead of purchasing printed books, but they will be legal users that can be engaged by the author or the publisher through additional means. Services that offer social reading (especially if matched to cloud-based reading) can also play an important role in increasing the viral buzz of books. People can share what they read with their friends and colleagues. This enables books to reach potential readers much faster than might have been imagined as recently as a few years ago. At 24symbols we have already examples of works that have been accessed and shared by thousands of people that has led not only to increased online recognition, but a tangible increase in the purchase of print editions. Much has been said about the Long Tail. In the case of the publishing industry, e-books might solve a nightmare for publishers and a problem for readers, which is the lack of access to out-of-print books. Some effort will have to be made to digitize those books for which reprinting is not financially viable, but once achieved, these books can be highly profitable as part of their overall business model, increasing the reader’s satisfaction with “the industry.” A cloud-based subscription model would be able to, in turn, offer the reader the ability to browse these books she would have never had the opportunity to purchase directly, while returning revenue to the publisher and author every time it happens. Self-publishing platforms offer authors a new way to be discovered. Yes, a small fraction of them will be capable of having a career on their own, but most authors want to write, and would prefer to cede part of their earnings to seasoned professionals who would take care of the rest. Publishers and editors will always be required. The issue is that in order to be relevant, experimentation is required. Both in terms of new authors, new types of storytelling, and also new business models. Coming from the realms of product and service innovation and strategy, my experience tells me that if one waits until the future is clear…the culture has passed you by and you’re out of the game. I attended the Digital Conference organized along the London Book Fair last April, and it was clear that many of the experimental digital books being produced today (e.g. enhanced e-books for iPad) are being done by authors directly, with the help of technology companies, but with no actual publisher as part of the team. Does that make sense? From the perspective of 24symbols, publishers provide us with the affirmation of quality work and marketability, not to mention technically solid ePub files. Clearly, we need all that. Books Are Not Dead, But Long Live Books-as-a-Service! We will still be reading and buying printed books in ten or, even, 20 years. But, as Tim O’Reilly correctly stated a few months ago, form and format are not the same. Books will outlive all of us, and will find the appropriate ways to be visualized and enjoyed. Some of them will be better enjoyed in print, while others will be digital. Even digital books will be organized by different types (or dimensions): enhanced, textual, hyperlinked, social…whatever we can come up with that makes sense to the world. A new “format” appearing now is the “Book as a Service” concept, one that has been already been offered by O’Reilly Safari for a few years, but that it’s about to explode onto the mainstream. It is the 24symbols is working hard to achieve. Once a book is in the cloud, the number of options available to the reader goes beyond merely reading or browsing a book. Instead, it offers access to an ongoing and semantically hyperlinked world of opportunities. Say you want to access a specific page of a reference book? You can do it — and the publisher gets paid for it through either an ad-based or subscription revenue model. Want to find information about the author, the publisher, related books, or about specific products, places or characters mentioned in the story? Want to find recommended books, but based not only on the book you’re currently reading, but on your past history or profile? Or should you, instead, take a look at what my friends are reading now? Summarizing, Books-as-a-Service means accessing your favorite content whenever you want, wherever you are, and however you need it. The publishing industry is facing as many challenges now as did the music and movie industries in the past. The number of eBooks sold in 2010 and the first months of 2011, the explosion in the number of reading devices in the market, the involvement of the big technological companies, the need for a better discoverability…everything tells us this is the new hot content and media market. We need to carefully, strategically, but also decisively and boldly take decisions, with the readers’ needs as the epicenter of our actions. A subscription/freemium model with cloud and social reading capabilities is, clearly, one of the key alternative channels and offerings. DISCUSS: How Would You Model a Could-Based Subscription Model for E-books? Justo Hidalgo is the co-founder of 24symbols, a platform to read eBooks on the Internet, with your friends and based on a subscription model. He will be featured as a speaker at TOC Frankfurt (in conversation with Sophie Rochester) about his company and the progress they’ve made. You can learn more and register for TOC Frankfurt here.